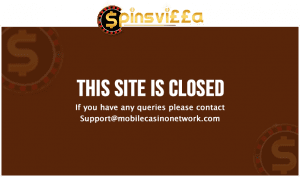 The guys at Spinsvilla have some unfortunate news, Spinsvilla casino is now closed to all players. This is sad news for us at Casino4U.co.uk as this is one less casino that we can offer you guys to play at. Online Casinos close for a number of reasons, but this is yet more evidence of how volatile this industry really is! We will miss the guys at Spinsvilla and we are sad to see such a great branded casino close. This really is devastating news for all, with such an attractive brand closing its doors. Many casinos as of late have stopped providing their service for UK players, as a result, of the continuing changes of regulations. However, Spinsvilla Casino is closing for ALL players. We will update all of our pages featuring Spinsvilla, in particular, our Spinsvilla Casino Review with this news. We will get our experts to compile a list of our highest rated and most similar casinos. Giving you guys an instant range of our other great featured casinos. We will do our best to keep you guys pleased, even with unfortunate news like this. As one casino closes, and we will miss the guys at Spinsvilla, we are constantly adding new casinos to our extensive list! Be sure to keep up to date with the latest featured casinos we add! If you have any queries on this casino closure, do not hesitate to let us know and we will do our best to be as helpful as possible for you guys. Therefore, we thank you for your co-operation.